We have had some AMAZING weather here in the city this past week. It seems summer in Lakeview is right around the corner! But then again, we live in the Midwest, so of course, it dropped a tad for this weekend. Unlike the weather currently outside, we were on FIRE this week here at The Loft. We had a soon to be college student come in after getting her braces off. Whoo-hoo!! She loved the outcome of her alignment from orthodontics but still wasn’t fully satisfied with her teeth. She was not happy about how low her gums were on her front teeth, and wanted to brighten them up to make them pop! Dr. Jessica Emery strives for all cosmetic dentistry. And in this instance, we were able to do some tissue recontouring on her front teeth! It made her teeth look larger in size and have a more broad smile. After recontouring, she wanted to whiten her pearly whites before heading off to school. 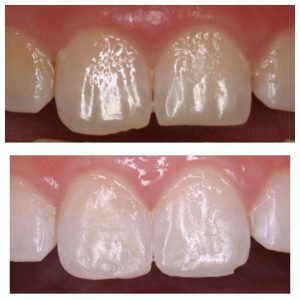 Zoom whitening was perfect for her and in a 2-hour process, we got her up to 6 shades lighter! She fell IN LOVE with her new smile. Once she comes back on break from college, she will come back to us for some small facial bonding on a few spots. Check out her before and after below! This week, we also had the lovely girls of Once Upon A Dollhouse pop in! 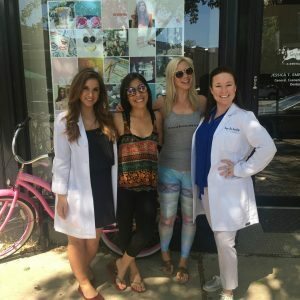 Their blog is so fun, flirty, and informative! We suggest you check them out. They were due for their 6 month check up, and we always LOVE having them at Sugar Fix Dental Loft! We love when the Dolls pop in to Sugar Fix! We hope you have a wonderful weekend and make sure to check back in next week to see what the Sugar Squad was up to!